When it comes to the kitchen, a dish drying rack is ranked as one of the most vital and essential components of a modern kitchen. These racks are inexpensive when compared with other items in the kitchen but facilitate the smoother running of operations in the kitchen. Well, no one likes their kitchen looking like a complete mess finding cups and place all over the shelves and sinks, if you don’t want that scene in your kitchen and prefer it looks neat and well organized this dish rack can be helpful. At first, it helps to drain all the excess water from your utensils and let them dry much quicker, and secondly, it helps you to arrange all of your cookware nice & smooth at one place. It reduces the water clogging to zero and thus avoids harboring bacteria and germs which can cause health issues. I suggest you get the Polder Advantage Dish Rack, there is a reason why this is our first pick. It is a perfect sized rack for a four-person household, and at the time it can accommodate some extra dishes too, thanks to its addition pullout tray. Made from the stainless steel and composite plastic this rack is very much durable and stable. The frames are made of high-quality stainless steel so that it won’t get corroded anytime in the future. It requires very less maintenance and is also very much easy to clean and is elegantly designed for the averagely sized sink. It offers separate cutlery holders. In a nutshell, it is more than sufficient to take care of all your cookware. Has a better drainer which works great. For some reasons and other if you could not pick up the Polder for your kitchen then still you have a rack equally spacious and unique. The Slim Wire Frame Dish Rack from simplehuman smaller in size as compared to the Polder but still can hold the same number of cookware, thus its ideal for a four-person family with an average sink size. Being smaller and on the longer drain side it consumes less space in your kitchen and serves as an excellent replacement for a larger dish rack. This rack is made from stainless steel and plastic, so it is not going to corrode meaning its quite durable. It would have been top of this list is some complaints regarding build quality were not made. This rack has a separate cutlery holder and a beautiful bamboo knife block. 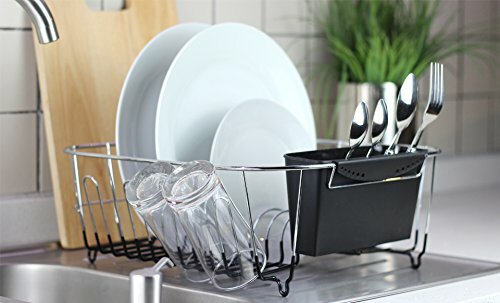 Then this Simplehuman Steel Frame Dish Rack might be the perfect choice for you as it is one of the largest dish drying racks which we have reviewed. Obviously, it costs more but also offers extra space and sturdy quality. This monster size Dish Rack can accommodate a large number of dishes. For starters, it has a removable wine glass holder that can hold up to four wine glasses. This rack comes with drain boards, a set of cup holder attachments and a special board attachment which can accommodate average sized pan. Moreover, it has an innovative drainage design which directs water flow directly into the drain. The rack is designed from stainless steel and has a fingerprint-proof finish, so it always looks new. Then this one is designed for your compact kitchen. The Chef’n CleanGenuity Garden Dish Rack is an ideal choice for a two to three-membered family and can accommodate all of their cookware. It is designed smartly to fit in the sink or on the countertop. It features a unique drainage silicon spout and an angular design which directs the water into the spout which can be opened and closed as per the needs, so you don’t need to keep it always near the sink. What makes this rack more exciting is that it has removable utensil holder so you can place the utensil where you find space. Even though it is made entirely of plastic, it looks sturdy and durable. we have got Lipper International 8813 Bamboo Folding Dishrack for you. This rack is 100% natural; the bamboo dish drying rack would undoubtedly prove to be an attractive addition to your kitchen décor. It is best for air drying your dishes and won’t get damaged by the water as bamboos are naturally waterproof. It can house a large number of dishes, for mugs, cups, and glasses there is an angled shelf provided where you can keep them in high numbers. Similarly, slots are made for dishes where you can store them in abundance. It is easier to clean and won’t get stained either. Moreover, it can be folded and kept away when not in use. It gets quite complicated when you are looking for the perfect dish drying rack, and you may get frustrated soon but doesn’t worry we have got you covered on that. There are some features which you can look at while making the selection. One of the essential features which you should look for it the drainage system. Is the frame provided with an additional tray that can collect the excess water or it simply pours on the grounding surface? If a rack is provided with proper drainage system then, it can directly be placed on the final place else you must wait for all the water to run off. Well, this becomes one of the deciding factors for the time taken by the utensils to get completely dry. If the rack has been provided with proper spacing, it will lead a better airflow around the utensils and make them dry much quicker. What’s the use of buying a rack which won’t allow your cookware to dry quickly? So look for a stand which has nice ventilation and allows for maximum airflow. This is the one factor for which after a lot of research and debate I was still unclear about what size to go for as the size varies from person to person and the number of cookware which you use. The rack must be big enough such that it can accommodate all the utensils which you use at a time and at the same time it must be well sized up as per the space available in your kitchen. Depending on your requirements there are a lot of choices are available in the market you just need to pick the correct one. When you are going to invest your hard earned money into something then you must want it durable so that you may not have to purchase it again in the future. While making the choice, look for the model which is sturdily built and would last longer. Try to go for the racks which are made from stainless steel as they won’t get corroded even after prolonged use in wet conditions. Apart from the features mentioned above, there are some other things that you want to have a loon on before deciding that which model you should go with and whether it would fulfill all your requirements. These are mentioned below. Design: It becomes a major aspect when you are selecting a rack as some of the racks are designed for optimum space utilization while others are designed to fit into the sink. Portability: It comes into play when your sink is far away from your storage, so you need to look for a model that is easy to lift and carry. Additional holders: There are quite a few options with other storage holders for knife, chopsticks, and cutlery. You need to look what you need. Price: Decide a budget which you can spend easily and then carefully mark your requirements. Cleaning option: You may need to clean the dish rack once in a while still select a model that can be cleaned easily, else you will be having a hard time later. Currently, there are a lot of dish drying racks available in the market but when you are out there to select the one you may get confused as all of them would look similar to you and would consume a lot of time. But you don’t need to worry as we have got you covered on that, after a careful examination and research of over 40 hours we came up with some of the best dish drying models. After reading this article, you would be more familiar with some of the high-grade dish drying rack available in the market and what factors to consider while buying them. Now can quickly pick a stand which serves your needs best. Our list has some of the best racks so you can pick anyone from it as all of them are sufficient to meet your requirements. I would like to recommend the Polder is your kitchen needs is minimum as it is one of the best racks available regarding quality, design and spacious or the Lipper International as it is completely natural and looks amazing besides providing all the features you require.